There are a handful of tasks we are asking you to complete prior to the beginning of the institute. Already Registered? CLICK HERE for a more detailed description of each task. Prior to starting your pre-institute activities you will need to visit The Dinner Party Curriculum Project. Here you will find immediate access to the introductory materials and philosophical foundation of the Curriculum. 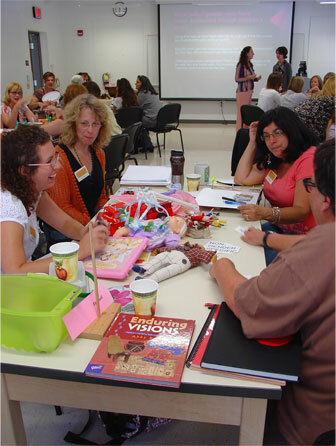 To complete your activities, you will need to have access to the themes and teaching strategies, which are referred to as Encounters and Classroom Connections in The DPCP. Extending the Invitation: We are asking that you bring the name of a woman who you would like to “invite” to be among the women honored in The Dinner Party. Many of you know that Judy Chicago and the many people who assisted her used a set of criteria to determine what women would be included in The Dinner Party. This is explained in one of the encounters of The Dinner Party Curriculum. Please see Encounter II: Extending the Invitation (click on the word, “Encounter II,” in gold). Encounter 1: Table Talk provides a way for you all to get to know each other around the metaphor of the “table,” an obvious metaphor of The Dinner Party.